Exploring Gwaii Haanas with Bluewater Adventures. Photo by Sue Frause. The Haida Heritage Centre officially opened last month in Skidegate, British Columbia after 15 years of planning and development. The centre sits on land that was set aside more than 30 years ago, on the site of the old seaside village of Kaay Llnagaay. Although the centre has been operational since July of 2007, the official grand opening ceremony on August 23 marked the completion of the facility. It includes new exhibits on Gwaii Haanas National Park Reserve and the Haida Heritage Site. Haida Heritage Centre is a 53,000 sq. ft. cedar complex consisting of five contemporary monumental timber longhouses. The centre houses the expanded Haida Gwaii Museum, Performing House, Canoe House, Bill Reid Teaching Centre, Carving Shed, gift shop, cafe,meeting rooms/classrooms and additional temporary exhibition space. Fall/winter hours begin September 19 and run through April 30, 2009. They are Tuesdays through Saturdays, 10-5 (closed on Sundays-Mondays). Haida Gwaii, known to the Haida as Islands of the People, is a diverse archipelago of more than 150 islands located on the northwest coast of British Columbia. They are also known as the Queen Charlotte Islands. 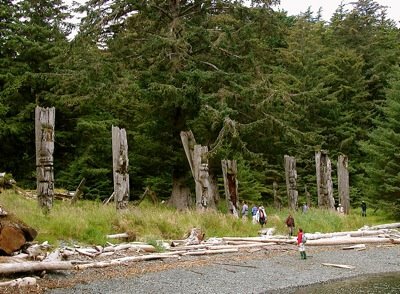 Nestled below the Alaskan Panhandle and separated from the BC mainland by Hecate Strait, the Haida people have lived here for more than 12,000 years.